After a minor snowboarding mishap New Zealand, I ended up getting an x-ray at a public doctor’s office where I was living. 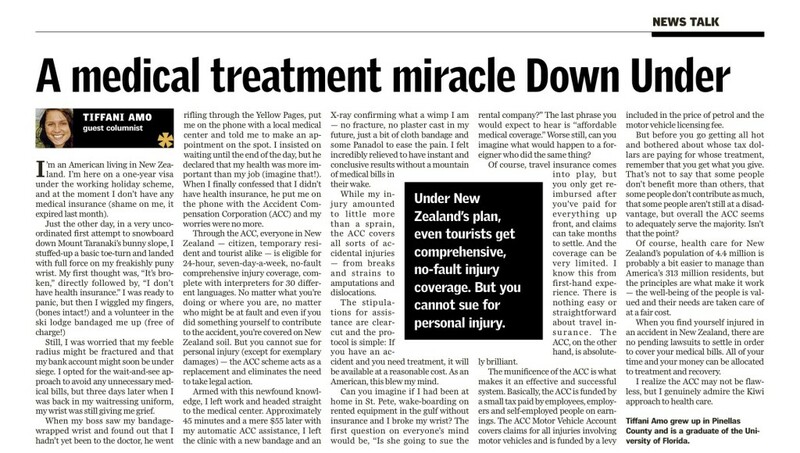 I was so surprised at how efficient and reasonably my visit was (thanks to the Accident Compensation Corporation) that I ended up writing an article for my blog. Instead I submitted the finished piece to the tbt*, where it was published in July 2013. For the published article, View this PDF. My grand plan is to write profound pieces about things, places and ideas that will better the world. In the mean time, I'm just stringing words together and waiting for a stroke of genius to hit me. My preference is feature-writing and creative human interest pieces, but my goal is to become a well-rounded journalist in all aspects of the field.